Well, it finally happened. Late last week my 16 year old son came to me and said "Dad, my HP Laptop won’t boot up". Wonderful. I went to his room to check it out and sure enough the machine was just continually cycling on startup. It would get to the Windows logo and display the progress bar, suddenly show the briefest flashes of a blue screen (so fast it was unreadable), then the reboot and start the process over. I tried doing a safe boot with each of the types available in the Windows boot menu but no luck. I suspect that the hard drive on the machine had started to go and that a key driver file had become corrupted. Since he’s a Junior in High School any machine we got him would likely be carted off to college in a year and a half. There may be another generation of MacBooks before that happens (or at least a minor refresh) so I decided to go another way. I bought him the entry level Mac Mini, rationalizing that it would be plenty powerful for his basic needs. I figured that in a year and a half I’ll buy him a new MacBook and claim the Mac Mini as a media center machine. I had a spare 120GB hard drive sitting around from my original MacBook after I upgraded it to a 320GB drive. A while back I picked up a small USB enclosure for it so that I could use it as an external drive; that became his Time Machine device. He’s had an older Logitech subwoofer 2.1 speaker system that generates some really decent sound so he’s got everything he needs to listen to his music. The last piece of the setup puzzle was installing iWork ’09, for which we have a family license. I turned the machine over to him with a couple of quick pointers: don’t just click the close button on an application’s window, click App Name / Quit. I also explained the Dock bar and the basic concepts around the Finder and how to use Spotlight. While my son can touch type incredibly fast he’s really not all of that into his computer; it’s mainly a tool for accessing his music, the web and writing up papers for school. When he first started using it he immediately set about doing multiple things at once: updating the music library in GarageBand (adding in the 1GB worth of stock music from Software Update), adding his music collection into iTunes from it’s temporary home on my internal server and actually listening to music at the same time. These little tasks seemed to bring the Mac Mini to its knees, making it slow to respond. I introduced Davey to spinning beach balls. A couple of hours after he started playing with it he called me over to tell me that it was reporting he was out of disk space. Huh? How could he be out of disk space so quickly? Sure, it’s only a 120GB hard drive but sheesh, he had over 75GB free when I gave it to him. My collection—which is over 100GB in size—was being added to his local hard drive and he was blowing out his remaining disk space. In addition Time Machine had started a cycle and he nearly blew that drive’s space out as well. Since my Mac Pro holds my music collection and it’s always on he didn’t need to have local copies of the music in order to listen to it. 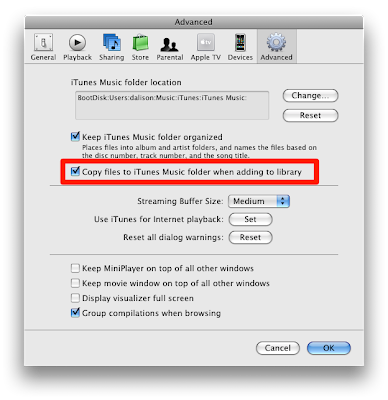 We changed the above setting, deleted the local copy of the music then re-added everything and it worked great. I also ended up erasing the Time Machine drive and starting that over. After another couple of hours everything was back to normal and running very nicely. Of course Macs have personality and I’m fond of coming up with Star Wars themed names for our computers. In this case I decided to break from my standards and use a name that also acknowledges my son is named after me. His new Mac is named Mini Me.